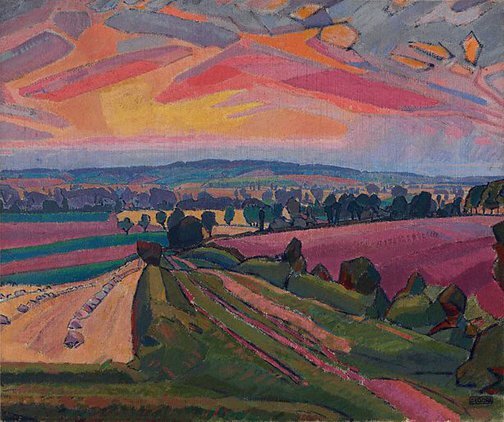 Spencer Gore's 'The Icknield Way' is a landscape of preternatural luminosity and compaction, which bears the stylistic imprint of Cezanne inflected by the more expressive accents of van Gogh and Gauguin. Lozenge-like simplifications of natural forms, particularly visible in the trees and clouds, unify the composition. The ensuing dynamic is both agitated and stable. Gore contrives to hold fragmentation at bay without loss of pictorial energy. He animates the work even further by exaggerating colour to a kaleidoscopic degree. This is topography deeply experienced rather than superficially observed. It is the artist's masterpiece .Gore was a founder member of the Camden Town Group, an alliance of younger artists around Walter Sickert. Popular and promising, Gore's premature death from influenza robbed the group of a leading light. Paintings of this kind exerted a considerable influence on the young Sydney painter Grace Cossington Smith, who may have seen them in London as early as 1912. The Redfern Gallery, pre 27 Apr 1962, London/England, Purchased by the AGNSW from the Redfern Gallery 1962. 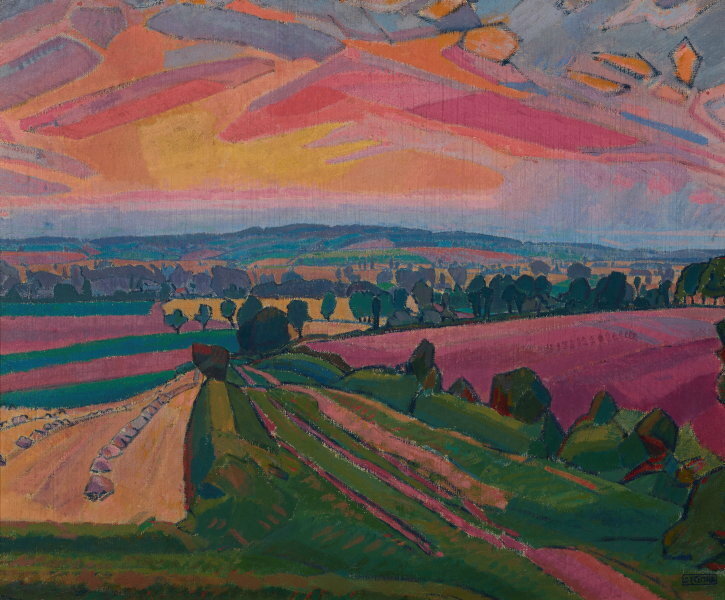 Purchased from the exhibition 'Spencer Gore 1878-1914, Frederick Gore 1913-' 1962, 6 February - 3 March 1962. Art Gallery of New South Wales picturebook , Sydney, 1972, 42 (colour illus.). Quentin Bell, Motif 11 , 'The Camden Town Group (2): Opposition and Composition', pg. 68-85, London, Winter 1963-1964, 72, 79 (illus.). Portrait of a Gallery , 'European 20th Century Art', pg. 91-95, Sydney, 1984, 94 (colour illus.). Renée Free, AGNSW Collections , 'The Western Heritage, Renaissance to Twentieth Century', pg. 108-172, Sydney, 1994, 146, 147 (colour illus.). Renée Free, Art Gallery of New South Wales handbook , 'European', pg. 36-56, Sydney, 1988, 55 (colour illus.). Art Gallery of New South Wales catalogue of British paintings , Sydney, 1987, 72 (illus. ), 73. Graham Hughes, Arts review [vol. 7, no. 21] , 'Spencer Gore and Stanley Spencer', London, 12 Nov 1955, 2. Bruce James, Art Gallery of New South Wales handbook , 'Western Collection: Paintings and Sculpture', pg. 17-77, Sydney, 1999, 54 (colour illus.). Art Gallery of New South Wales Quarterly, vol 4, no 3 , 'Acquisitions for 1962', pg. 139-147, Sydney, Apr 1963, 142 (illus. ).